Antique Beautiful Circular Plant stand. Old Still bank/Moneybox: Man with drum. Old Still bank/Moneybox: Man with drum.Casted metal/brass .Initials at drum: "WP" Unknown origin Worn..High: 3 1/4 inch/8 cm. Old Suchard Chocolate Cocoa Advertising Tin toy StereoScope /boxed w. pictures. Old Suchard Chocolate Cocoa Advertising Tin StereoScope in original box with pictures.Ca 1920.Lovely lithgraphy. Excellent condition. Sixe: ca W.5" /12,5 cm. Antique Dollhouse miniature food:Pig on plate.The plate is made of hard cardbard-Dresdner. The pig is served on grean vegetable on the plate. The pig is made of wood/composition. All original.The condition is excellent. Germany ca 1890. Fine for the kitchen or for a shop. Size of plate L. 2 1/8" / 6 cm. Would look great on the dining table. Antique Märklin Horse Race Game.German toy. Wonderful Antique Märklin Horse race game ca 1900 . Made of cast metal set on a metal base in a wooden base.6 different horses. You can bet on a horse and activate the race by pulling the handle at the side. It has the original Märklin flag.Stamped on the tin with the Märklin Sign. Excellent condition. Note:some wear to corner of wooden base. One horse has part of leg chipped off. Size: W. 36 cm x D.36 cm. High 30 cm. A great piece! 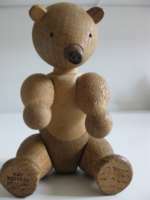 Vintage Wooden Kay Bojesen Toy- the famous Bear.Danish classical design.